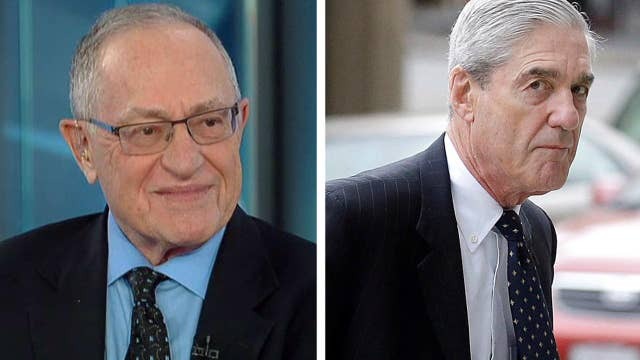 Harvard Law Professor Alan Dershowitz reacted to reports that Special Counsel Robert Mueller is investigating President Donald Trump for possible collusion, but does not consider Trump a criminal target in the probe. Dershowitz, a longtime Democrat who supported Hillary Clinton in 2016, said Mueller would be "inventing a crime" to charge Trump in that case. "There's no such crime as 'collusion' in the federal statute," he said. The [Washington Post], citing "three people familiar with the discussions," reported that Mueller made the comments while negotiating with Trump's attorneys about a potential interview with the president. The Post also reported -- citing "two people with knowledge of the conversations" -- that Mueller reiterated his need to interview Trump to determine whether the president intended to halt the Russia investigation while in office. According to the Post, Trump has "privately expressed relief" at Mueller's description of his legal status, but some advisers have warned that the special counsel may be baiting the president into letting his guard down for any interview. Mueller also has said he needs to interview Trump in order to complete a report he will present to Deputy Attorney General Rod Rosenstein, who is overseeing the investigation and who could decide to make Mueller's report public. Dershowitz said collusion may be a "political sin" but Congress would first have to pass a resolution declaring collusion a federal crime. Judge Andrew Napolitano weighed in on the same issue recently, warning that Mueller could be pursuing a conspiracy case for working with Russia to "obtain something of value" to help the Trump campaign. He and Sean Hannity also discussed criticisms of Deputy Attorney General Rod Rosenstein as it pertains to the Trump investigation.